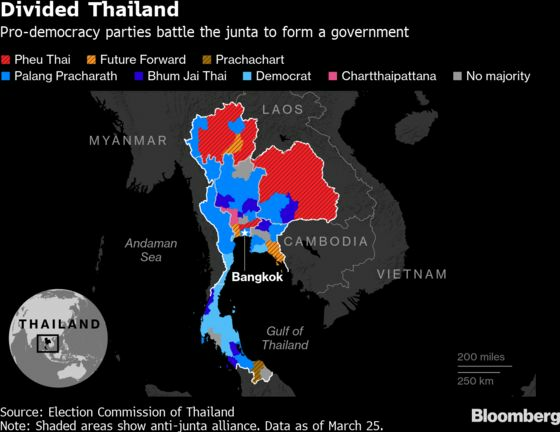 (Bloomberg) -- Seven political parties opposed to Thailand’s ruling junta said they had the numbers to form a majority coalition following Sunday’s general election, intensifying a tussle for power with a pro-military bloc. 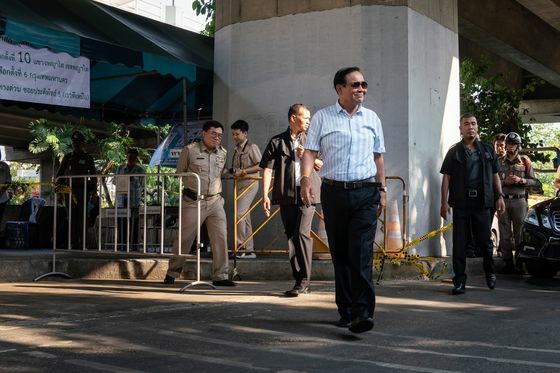 Sudarat Keyuraphan, a leader of the Pheu Thai party linked to exiled former premier Thaksin Shinawatra, said the coalition would unofficially have 255 seats in the 500-seat lower house. The bloc includes Future Forward, an upstart anti-junta party, and five smaller parties. “It’s clear that pro-democracy parties have a mandate from the people in this election,” said Sudarat, who the coalition is backing as the next prime minister. 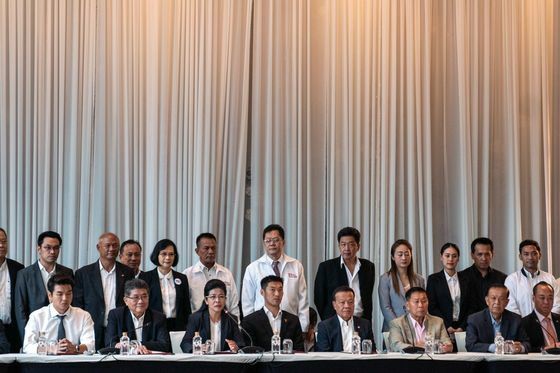 Pheu Thai and its allies are racing to cement a majority alliance against the junta’s proxy party Palang Pracharath, which is also seeking to form a government. The power struggle has dimmed Thailand’s economic outlook after almost five years of enforced calm under a military government. The benchmark SET index of stocks slid after the briefing began, declining as much as 0.5 percent, and was trading down 0.1 percent as of 12:06 p.m. in Bangkok. Palang Pracharath responded immediately after the announcement, saying the Election Commission hasn’t released the full results yet and the party’s lead in the popular vote means the public wants junta leader Prayuth Chan-Ocha to return as prime minister. Asked about Pheu Thai’s plans to form a government ahead of the announcement, Deputy Prime Minister Wissanu Krea-Ngam said it would have a “psychological impact” but the election results haven’t been determined yet. Anything could change ahead of a vote for prime minister in the National Assembly, which could take place late May to early June. The prime minister will be selected in a joint vote of the lower house and a 250-strong junta-appointed Senate that’s expected to back Prayuth. That represents a substantial hurdle for the anti-junta alliance even with a majority coalition in place. Members of the anti-junta alliance implored other parties to join them, warning that any government without a firm majority in the lower house would be unstable. While the Senate gets a vote for prime minister, it doesn’t have a say in any no-confidence votes -- making any leader in a minority government vulnerable. The election has been dogged by claims of unfairness, with Thaksin describing it as “rigged” in favor of the junta. The release of a partial, provisional tally of constituency seats was delayed by a day to Monday, stoking criticism. Poll observers said the system for reporting the count was flawed. The Election Commission, which cited technical difficulties for the delays, plans to release the vote count on Friday, which will help give a clearer picture of the lower house. Prayuth is backed by the royalist and military elite who have long dueled for power with Thaksin. He or his allies draw support from the rural poor and won the most seats in every election held since 2001, only to be unseated by coups or the courts.